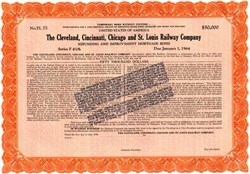 Beautifully engraved unissued $5000 Bond certificate from the Cleveland, Cincinnatic, Chicago and St. Louis Railway Company issued in 1938. This historic document was printed by the American Banknote Company, and has an stamp on the face indicating it is no longer payable in gold coin due to FDR law change in 1933. This item is over 73 years old.